This webpage provides a brief description of nitrogen oxide (NOx) emissions and general information about the air quality programs in New England that focus on reducing NOx. Nitrogen Oxides are a family of poisonous, highly reactive gases. These gases form when fuel is burned at high temperatures. NOx pollution is emitted by automobiles, trucks and various non-road vehicles (e.g., construction equipment, boats, etc.) as well as industrial sources such as power plants, industrial boilers, cement kilns, and turbines. NOx often appears as a brownish gas. It is a strong oxidizing agent and plays a major role in the atmospheric reactions with volatile organic compounds (VOC) that produce ozone (smog) on hot summer days. The pie chart below shows how NOx emissions in New England were distributed among the various sectors in 2002. The New England states have adopted regulations that require many facilities to reduce NOx emissions. These emissions can be reduced by making process changes (such as modifications to the combustion process) or by installing air pollution control equipment (such as selective non-catalytic reduction (SNCR) or selective catalytic reduction (SCR)). To see a geographical representation of where the largest NOx sources in New England based on 1990 emissions were located, click the map link below. Pointing your mouse at the emission points on the map will indicate the source name and the actual amount of NOx emitted in 1990. 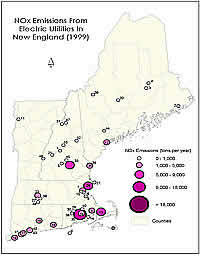 Click the image above to view a more detailed map* of NOx Emission Sources in New England. State NOx regulations have to meet a level of stringency we call RACT, or Reasonably Available Control Technology. RACT is defined as the lowest level of emissions that can be achieved taking into account technical and economic considerations. EPA provides guidance on RACT in documents called Control Technique Guidelines. EPA reviews and comments on proposed State regulations during the state's public hearing process to ensure that these rules meet RACT and will achieve the emissions reduction projected. Once the state has adopted the NOx rule, EPA approves the rule into the state's State Implementation Plan (SIP). The state's NOx rule then becomes federally enforceable. For more information on the EPA's NOx RACT program click here. The Ozone Transport Region includes Maine, New Hampshire, Vermont, Massachusetts, Connecticut, Rhode Island, New York, New Jersey, Pennsylvania, Maryland, Delaware, the northern counties of Virginia, and the District of Columbia and is headed up by the Ozone Transport Commission (OTC). Exit The New England states have actively participated in the OTC's development of a regional NOx cap and trade program being implemented to address the regional transport. In September 1994, the OTC states developed a memorandum of understanding (MOU) to achieve regional emission reductions of NOx. By signing the MOU, the states committed to develop and adopt regulations that will reduce region-wide NOx emissions by more than 317,000 tons per year by 2003 through a NOx cap and allowance trading program. Generally, the OTC program requires large electricity generating and industrial NOx sources in southern New England to meet a NOx cap equivalent to the sources reducing 55% - 65% from a 1990 baseline, or emitting at a rate no greater than 0.20 pounds of NOx per million Btu of heat input (lb NOx/mmBtu), during the period between May 1 and October 1 (the ozone season). The program began in New Hampshire, Massachusetts, Rhode Island, and Connecticut on May 1, 1999. In northern New England, the program caps NOx emissions at the large sources at a level equivalent to NOx RACT. Emissions from utilities in New England have decreased 57% from 1990 to 1996 as a result of the OTC NOx Cap and trade program. The 1990, 1996 and 1999 NOx emissions from utilities in New England are graphed in a bar chart for comparison. The 1999 emissions are also represented geographically on the map link below. Click the image above to view a more detailed map* of NOx emissions from electric utilities in New England. Beginning in the ozone season of 2003, the OTC program becomes more stringent requiring sources in southern New England to meet a cap equivalent to the sources reducing seasonal emissions by 65% - 75% from a 1990 baseline, or emitting NOx at a rate no greater than 0.15 lb NOx/mmBtu of heat input. Similar provisions are also being implemented through the EPA's NOx SIP Call over a larger geographical area. The 1999 and 2003 OTC MOU limits are not automatically effective. They will only become effective upon adoption of regulations by each state. Subsequently, they will need to be approved by EPA into the SIPs. To date, New Hampshire, Massachusetts, Rhode Island, and Connecticut have finalized NOx cap and trade regulations which were approve by EPA New England. For additional information on the OTC program, as well as the EPA NOx SIP, please visit EPA's Clean Air Market Programs: NOx Trading Programs. The Ozone Transport Region (OTR) NOx Cap and Allowance Trading Program addresses emissions in the northeast states, however, long-range ozone transport involves large NOx emission sources outside of the OTR. The map link below shows how the 50 top SO2 and NOx sources compare to the top 5 sources in New England Map. This map is based on data from the Acid Rain Program which also served as a model for the Ozone Transport NOx SIP Call. Through a 2-year effort known as the Ozone Transport Assessment Group (OTAG), EPA worked in partnership with the 37 eastern-most states and the District of Columbia, industry representatives, and environmental groups to address ozone transport. OTAG identified and evaluated flexible and cost-effective strategies for reducing long-range transport of ozone and ozone precursors. Based on the OTAG process, on October 27, 1998, EPA published a final rulemaking action (63 FR 57356). The rulemaking, commonly referred to as the NOx SIP Call, required 22 eastern states and the District of Columbia to submit state implementation plans (SIPs) that set statewide ozone season NOx budgets which would reduce emissions of NOx. By reducing emissions of NOx, the actions directed by these plans will decrease the transport of ozone across state boundaries in the eastern half of the United States. A number of parties, including states, industry and labor groups, challenged the NOx SIP Call rule. On March 3, 2000, the D.C. Circuit ruled in favor of EPA on all major elements of the NOx SIP Call, however, the court did remand four minor issues, related to geography and definitions, back to the EPA. Based on the court ruling, EPA separated the NOx SIP Call into two separate implementation phases. Phase I includes implementation of the major elements upheld by the court whereas Phase II will include implementation of those issues the court remanded back to EPA. On February 12, 2002, the EPA proposed its response to the issues remanded by the court and also proposed additional technical amendments to the NOx SIP Call. The link below connects you to the proposal which was published in the Federal Register on February 22, 2002 (67 FR 8396). Phase I of the NOx SIP Call requires the following 19 states and the District of Columbia to submit NOx budget and trading rules by October 30, 2000: Alabama, Connecticut, District of Columbia, Delaware, Illinois, Indiana, Kentucky, Massachusetts, Maryland, Michigan, North Carolina, New Jersey, New York, Ohio, Pennsylvania, Rhode Island, South Carolina, Tennessee, Virginia, Wisconsin, and West Virginia. The state NOx budgets are required to be consistent with the statewide NOx budgets established by EPA. The EPA established the statewide NOx budgets using recommendations from OTAG on how to reduce emissions from utilities and other sources of NOx. EPA's rule is consistent with OTAG's recommendation for utilities: an emission rate limitation as low as 0.15 lbs/mmBtu or, 85% from sources 1990 emissions rate. For non-utility point sources, mobile sources, and area sources, OTAG recommended control of major non-utility boilers to achieve as much as 70% reduction from 1990 levels, and for federal control measures to be applied on area and mobile sources. Although the EPA's NOx SIP Call does not specify which sources must reduce NOx, utilities and large non-utility point sources would be one of the most likely sources of NOx emissions reductions. Based on the emission limit for utility sources, controls such as selective catalytic reduction (SCR) and selective non-catalytic reduction (SNCR) will likely be required on a number of units in the OTAG region. Such controls systems have been demonstrated to reduce NOx at a cost-effectiveness of less than $2,000 per ton at large sources. As part of the SIP call notice, EPA developed a regional "cap and trade" program as a means of achieving the proposed NOx reduction levels. EPA developed a model "cap and trade" regulation that was included in the final rulemaking notice in October 1998. The regional cap and trade program shares many of the features of the OTC MOU program. The New England states affected by the NOx SIP call have amended their OTC cap and trade regulations in order to meet the SIP call requirements. In addition, on September 15, 1999, EPA published a notice of proposed rulemaking in the Federal Register, 64 FR 50036, that proposed to redistribute the NOx budgets of Connecticut, Massachusetts, and Rhode Island based on a memorandum of understanding signed by the states and EPA in February 1999. On December 27, 2000, EPA New England approved the NOx budget and trading rules submitted by CT, MA and RI (See 65 FR 81743) in accordance with the redistributed NOx budgets. For further information regarding the OTC NOx Budget Program and the EPA's NOx SIP Call please visit the EPA's Clean Air Market Programs: NOx Trading Programs website which provides further links to the entire rulemaking history as well as frequently asked questions and facts.